Ceoltoiri Coleman is a group of musicians associated with the Coleman Heritage Center of Gurteen, Co. Sligo, and includes such luminaries as Colm O'Donnell (vocals, flute, tinwhistle) and Michael Hurley (flute, fiddle). This particular CD, recorded just prior to the ensemble's 2001 tour, follows the format of the live show, alternating numbers performed by the full ensemble with others recorded by singers or musicians playing solo or in duets, all very good. 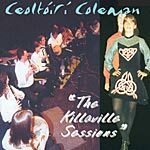 Throughout, the music has the vitality and energy, yet flowing quality associated with South Sligo, "Coleman Country" as it is known. Many of the tunes recorded are standards of the Sligo tradition, but there are a few rarities thrown in as well. The songs are performed by the great Colm O'Donnell and his daughter Siobhan.